Hi guys now that I have completed this chassis to give to a friend as a present I thought I would post some pics for you guys to check out and see what you think. I started out with a silver alloy fxx vip chassis and added all the alloy upgrades available at the time which included the front and rear lower arms, front and rear knuckles, alloy gearbox, reinforced prop shaft, alloy rear shock tower, ifs suspension conversion, alloy front top arms, rear solid spool. As green is her favourite colour I stripped the chassis down and dropped off all the alloy parts and had them anodised green and to say I was happy with the result was an understatement. I almost didn't want to give the chassis to her when i saw it reassembled and looking pimp as hell. Electrics for this chassis I went with the new sanwa super vortex zero plus which has the built in receiver which is really nice since it eliminates one box off the chassis and a nice savox servo and hobbywing v10 13.5t motor to finish it off. Since her previous rc car was using a cheap traxxas radio i bought her a sanwa mt4 radio to replace it. 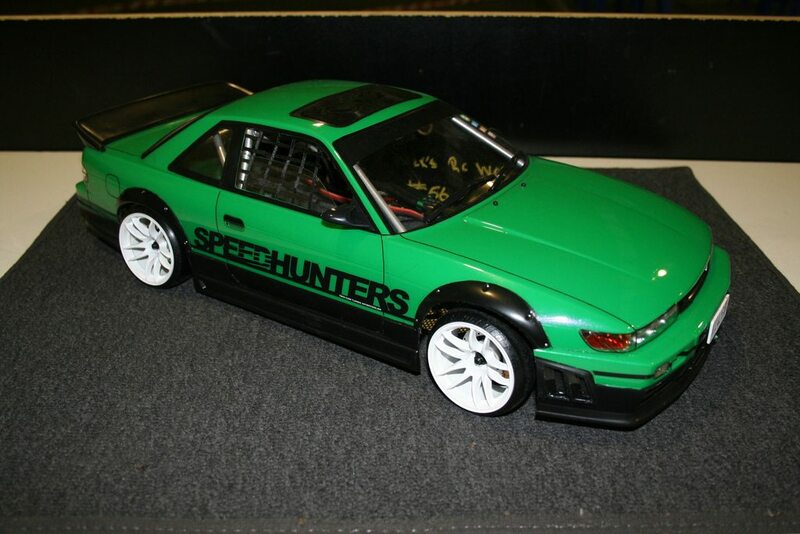 One last thing i did was have a mate of mine Mark make a sick looking abc hobbies S13 shell. The shell turned out amazing and Laura loved the entire package as you would imagine. 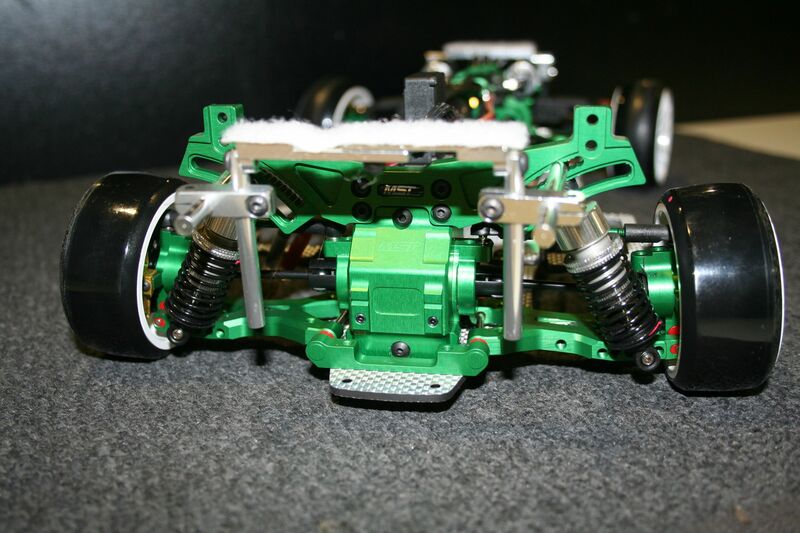 Here are some pics of the chassis for you guys to check out. I also put links for the high res images of the chassis if you wanted a better view of them. That's a nice colour, good job! The Chassis looks freaking awesome dude! I wanted a green FXX but didn't like to reanodize it. If I were you I would have probably reanodized the dampers and body mounts too and maybe used have black carbon instead of SSG. 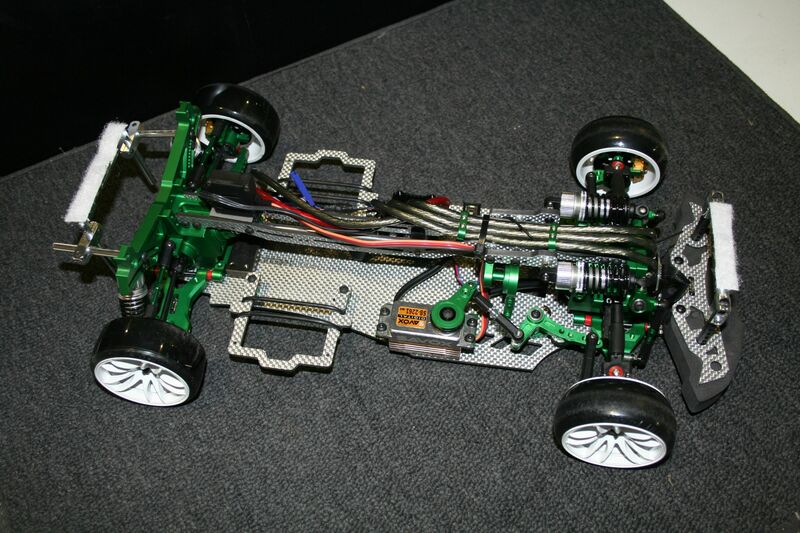 Thank you very much for sharing this insane Chassis! (06-20-2015, 05:25 AM)maxx Wrote: The Chassis looks freaking awesome dude! I wanted a green FXX but didn't like to reanodize it. If I were you I would have probably reanodized the dampers and body mounts too and maybe used have black carbon instead of SSG. 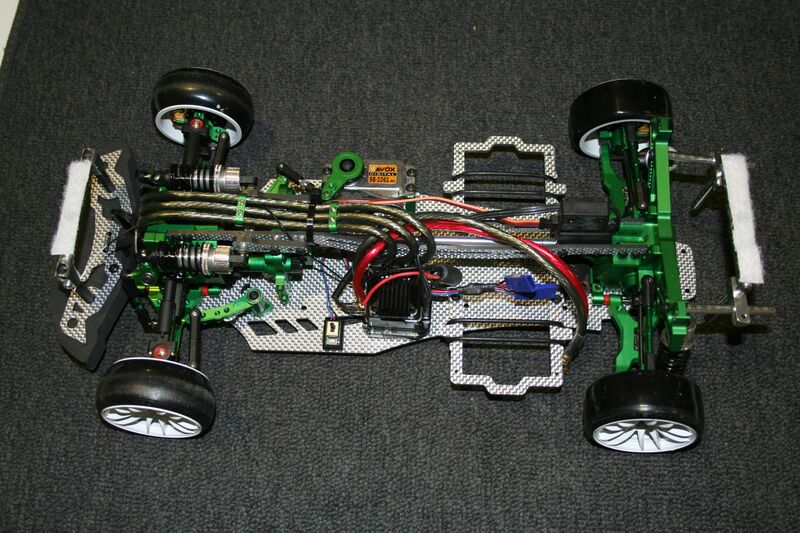 Thank you very much for sharing this insane Chassis! I thought about doing the dampers as well but I felt there was already so much green alloy I'd go for a 2 tone sort of colour scheme so I left a couple parts silver so it matches the ssg parts. Im planning to do my own fxx in a custom colour after i saw how well this one turned out just not sure what colour to do yet. Im thinking maybe go a full stealth look go black carbon with black alloy parts or maybe gold or blue. complete black FXX sounds cool too dude! "MST Mean Machine"?